Guidelines that can make your camping experience a little less messy and more enjoyable. So, enjoy your trip and stay safe with these beach camping tips and tricks. Beaches are mesmerizing. They can spellbind anyone, no matter if a person is a nature lover or not. How about spending your leisure day at the beach? You sleep near the glorious sea or another water body. On waking up midnight, you simply get out of your camp and can get pleasure from the gripping scene? Also, how about getting a chance to enjoy the sight of the first rays of a new sun falling on moving waves? Or, how about seeing that dull gold scene of a setting sun? Beach camping is all about this. Beach camping is amazing. But, it brings with it many unusual and unexpected instances. Campers need to have experience in understanding these changing beach circumstances. Only then, they can deal with the situation. What about beginners? They will learn all camping tips gradually. However, we can help them a little by offering our some brief guide. Who is going with you on Beach Camping? Which place to choose for camping? Which shelter item to use? So, are you planning to go to some beach camping adventure for the very first time? Then just go systematically and just pre-plan each and everything. If it’s actually your first time, then we hope you have started preparing weeks earlier. Even, if it is just making plans inside your mind. Now, here we are going to plan possibly everything with you. Continue reading to prepare for your beach camping. When you start planning your adventure, the first thing you will decide is your camping friends. This decision can seriously impact the fun factor of your activity. Having fun-loving cool-headed friends can transform any rough scenario into an amusing one. Contrarily, short-tempered companions can make your little difficulties into a great disturbance. Therefore, it is very important to choose your partner wisely. For beginners, however, it’s better to choose experienced campers as companions. You are done with deciding your camping team. The next thing looking for your consideration is your adventure place. It is another important decision that is going to decide your beach camping fate. Research properly while selecting your beach. Different online forums and National parks website can particularly help you in this matter. If camping is allowed in your selected destination? Is it open or closed due to cyclone season? If you can light a fire there? Is drinkable water resource available nearby? Is that beach safe for along stay? Can you take your vehicle there? Any other warnings, concerns, or tips specific to that beach? Getting the satisfactory answer to all these questions is enough to assure about the suitability of any beach. This step is also done. Now, let’s start preparing for the beach camp. Prepare your beach camping checklist. What are you going to add to the list? Not Sure? Stay calm. We are going to discuss it all. It is again one critical stage in your beach camping preparations. It is to decide things to bring for camping on the beach. What to take for the trip and what to leave behind? Answering this question is not easy for starters. Therefore, here we are making this easier for you by providing camping tips and tricks for beginners. We have sorted a detailed list of beach camping accessories that can come in handy on your trip. You can vary the quantity according to the number of your team members. Skip any of these items if you find suitable. Shelter place: It is definitely the most important thing among your beach camping gears. Take a tent and all its accessories with you. We hope you already know how to set up the tent. Shelter Base Protection: Beaches are different. You need protection for your tent as well. In order to protect your tent base from getting wet, take tarp with you as well. Tent protector: Rains are sometimes unpredictable. Also, across beaches, water sprays are very common. Therefore, it is wise to take a rain fly or other covering with you. Anchors: Take proper measures to secure your tent tightly. For this purpose, you can take sand filled small bags. You can also use other tricks you find convenient. Rope: Take some long rope with you as well. Why? It can come handy in many situations. Hanging wet clothes is simplest one among other uses. Sleeping place: Your tent is a place to accommodate many things. Where are you going to sleep? Take sleeping bags, sleeping pads, mat or small mattress with you. Also, take one small pillow and blanket. Pick these things according to your sleeping preferences. Also, consider the weather while picking up these items. Chairs: Although it is not mandatory, if you can, take camp chairs with you as well. Broom and Dustpan: Compact sized broom and dustpan is one important thing for beach camping. Wondering why? It will help you in keeping minute beach elements away from your territory. Tools: Take a few necessary tools with you. It may include a saw, shovel, a few sharp knives etc. These tools should be sharp enough to cut small woods and ropes. Guidebook: Take local area guides, and maps with you. They will help you towards many important points in case of an emergency. Lighting system: It is not necessary that you will be able to light up the fire whenever you would need. As we have already mentioned, beaches are unpredictable. That’s why take a few lanterns, lamps, or waterproof flashlights with you. Don’t forget matchboxes as well. First aid accessories: It is another important thing in your basket. We don’t need to tell you the reasons. It should contain all necessary bandages, antiseptics, and other stuff. Cooking accessories: Take a small camp stove with you. it will come handy when you will not be able to light up the fire. Also take small utensils, like bowls, spoons, mugs etc. Water Pots: You can’t use seawater for drinking purpose. However, we hope you get drinkable water near your camps. In that case, too, you are going to need the help of the water pots. Put them as well with other accessories. Trash disposal items: You should bring trash bags with you to carry your garbage along with you. Besides, as you are also going to need toilet paper, do a proper arrangement for their disposal as well. Personal hygienic items: Take toilet paper, paper towel, hand wash, shampoo, soap, sanitizers, towels, and other basic stuff to stay hygienic. Other beach camping items: These are the list of few major items that are inevitable during your beach camping. However, there are many other items that can come in handy. It includes dishwashing soap, a hat, insect repellent, sunscreen (an important one), sunglasses, umbrella, extra clothes, life jackets, bathing suits, and firewoods. Now, this is quite an extensive list of your beach camping gadgets. You can trim it according to your choice and situation. So you have fully prepared for your adventure. Set out to have some amazing camping experience. Now here are few beach camping tips waiting for your attention after you reach your destination. You can’t know exactly about any beach situation unless you reach there. Therefore, after reaching there, spend enough time in analyzing your surroundings. Start your examination of weather conditions. How is it going to be throughout your stay? Is it hot or cold enough? The answer to these questions can really affect the way you are going to spend your days. Now, as you have analyzed the weather conditions, you can decide how you are going to stay here. First thing comes here is your shelter place. Which item is suitable for you? Here, you have got a few options. If the weather is hot and dry, you can use your trap as a tilted shady area throughout the day. It will be quite easy to set up. Also, you will get enough of shade and proper ventilation. These both things are requirements of hot sunny days. Remember! Utilize this option only if precipitation is low and the environment feels considerably dry. If the weather seems unstable, or there is enough humidity, go for proper tents. A complete tent can not only protect you from sea humidity, but it will also keep bugs away. Don’t forget to have proper ventilation in your fully packed tent. It might sound weird, but yes this is also the available option. But, here again, there are few restrictions. Your weather conditions must be highly suitable. Also, you should have a comfortable and safe place to sleep. Getting all appropriate conditions can turn your adventure to the next level. Simply, spread your tart and sleeping place, lay down and enjoy the sky full of shining stars. Choose your sleeping place according to weather condition as well. As beaches usually get quite cold during nights, it’s better to sleep inside your sleeping bag. On the other case, if you find weather pretty hot, use sleep sheet instead of the bag. You may consider also travel trailer campers if you liked. This question might sound simple. In reality, it can take your hours for deciding the place. You have got the whole beach there. But you simply cannot put your beach camping tents wherever you want. Think about different factors before anchoring your tent. Besides weather, analyzing your terrain is equally important or even more than it. First thing comes here is checking tide-line. It’s better to get a tide chart for that area. It will make you aware of sea behavior. However, in case, you don’t get any, simply observe the beach. Go for checking debris line that previous tide has made on the beach. Always camp at least 20 meters away from the previous tide line. You just never know the sea ferociousness. Today’s tide can even be higher than the previous one. Remember, these tides are wilder during new and full moon phases. What weather forecast is telling you? Are there any chances of storms or heavy winds? Then, stay protected. Put your tent across some natural barriers. It could be any vegetation piece or a pair of trees. If there is a jungle near you, it would be better to stay away from the sea and close to the jungle for heavy winds protection. Undoubtedly, dunes can be a good place for camping. But, it is not appropriate for any camper to destroy natural beauties. Never camp on dunes. However, you can put your camp near them. In this case, they will somehow protect you from water aggressive moods. After you are done with your camping, the next step comes is to think about your beach camping food. You are at your campsite. You just cannot enjoy lavish meals. All you can take comfort with you is snacks, sandwiches, and other simple food items. However, if you know how to set fire properly, there are chances you can arrange some good meal. For that, you would have to prepare earlier for setting out for camping. Besides, we just hope, you get potable water resource nearby. Fill your water pots from there, and enjoy. If this is not the case, then you would have to keep gallons of water with you. Another available option is to take some filters with you. Utilize water from your nearby water body. Filter it, to make it safe for your health. Now as you are done with fulfilling all your basic camping necessities, don’t forget about others. These beaches and water bodies are public places. You are not supposed to harm them in any way. In this context, you should never throw any type of garbage in your surroundings. Dispose of them properly. Also, never damage dunes in any way. They might get harmed merely by walking on them. Therefore, avoid doing it yourself. Ask kids to stay with them as well. Anything, you get to see as a sea treasure; don’t consider them as your private asset. Just enjoy their view, and leave them behind for others. Here are few beach camping suggestions and information that can come in handy during your adventurous trip. Harsh sun rays usually don’t make you feel irritated, right? Forget about this fact at least for your beach camping trip. Why? Because the intensity of these rays almost gets double on beaches. Water waves usually reflect solar radiations. It all ends up in the harsh sunlight that can even burn your skin. Therefore, it becomes double triple important to go for sun protection measures while camping across beaches. Do you love playing in the sand? Yes, most people do. Avail the opportunity of enjoying the beach full of sand. But, don’t forget how these small sand particles can turn your fun-filled trip to an irritating one. Don’t let even a small amount of sand particles to enter your tent, sleeping area, bags, or any other such stuff. If it happens, then these particles are going to follow you to your home. Most probably, they will even stay with you for almost year inside your tent, sleeping bags, and other accessories. That’s why it is very crucial to keep this sand away. For this, use a small broom to clean your tent. You can also keep a water bucket with your tent. Wash your hands and feet properly before entering your temporary home. During your stay at the beaches, it is very important to know how to set a fire. But, it is not that easy as it may sound. You need enough experience to do it perfectly. Here are a few tricks. As winds are heavy on beaches, make some small hole by digging sand. In this way, the wind will not harm your fire. Also, it would be easy to control it. If the weather is normal, make a small round of fire. Fill it will small wood particles. Try picking these woods from the area far from the water body. Once a small amount of fire has set, start adding a few fire-aiding items. You can also put large wood pieces after burning a small one. This method will help to dry the large wood pieces. It can help in setting the proper fire, in case your woods are slightly wet. Whether you camp across beaches or jungle, your safety is the most important thing. Never, compromise of taking proper safety measures. If sunlight is seriously scorching, don’t forget to apply sunscreen. Also, wear sunglasses to protect your eyes. Don’t be lazy and let insects bite you. It could be dangerous. Keep them away from using some insects repellent. In case you want to go deep inside the water, don’t forget to wear life jackets. You might find it weird, but you can go dehydrated around As you stay exposed to the sun directly, staying hydrated becomes even more important. Must take some safety tools with you. Take proper safety measures, as there will be no lifeguards to protect you from some serious circumstances. Q. What is the basic difference between beach camping and others? A. There are basically four natural factors that make beach camping completely different from other types of camping. These things include rain, wind, sun, and bugs. Sun can behave weirdly harsh at beaches. You simply cannot hide away from it. You are already aware of beaches winds’ intensity. Unlike other areas, rains can hit beaches all of sudden. Moreover, because of the waterbody, it can easily convert into a thunderstorm within no time. Whether attracts a huge number of insects. These bugs come out to visit campers inside their camps. Q. How can we stay protected from bugs? Screened shelter with very tiny holes. It can keep your protected from bugs. Scented oil lamps are quite effective in keeping bugs away from you. Setting a fire in front of your camp can also help in this matter. Q. What are preventive tips or beach camping ideas? A. 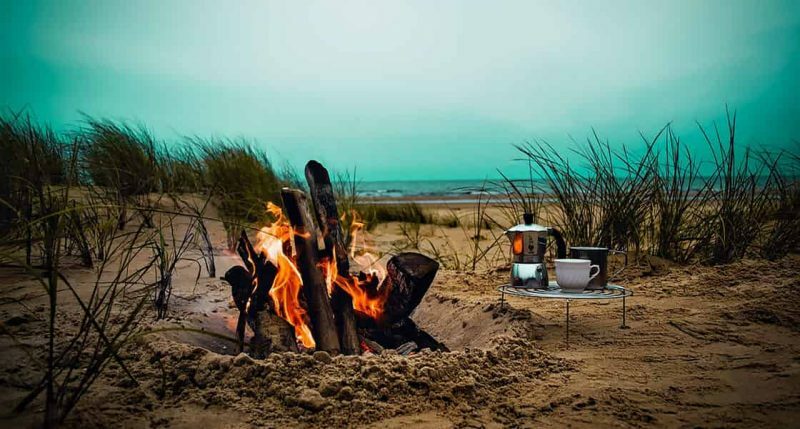 Here are a few beach camping ideas that can protect you from many difficulties. Take all your small stuff inside the camp while sleeping, or during strong winds. Put extra batteries with your flashlights. Before setting up your tent, level the sand properly. Bring tightly closed containers to store your food. Put extra towels with you. Q. How can we make our beach camping trip more enjoyable? A. Beach camping is not a easy stuff, especially for beginners. Therefore, in order to enjoy your trip to its fullest, you will first need to accept the fact. Difficulties do come and go. But, the thing that remains behind is your behavior in these situations. Stay calm. There is a solution to every problem. You went there for having fun. Also, as you are going to have plenty of free time there, take some cards or other small games stuff with you to enjoy your trip at the next level. Q. How to keep my skin protected during beach camping? A. As the atmospheric situation around beaches is harsh, you are required to take a few ointments with you. First of all, don’t forget to bring good-quality sunscreen with you. It should be strong enough to protect you from intense sunlight. The second thing you need to take is some good moisturizers. Winds across beaches are wild, they may turn your smooth skin into a rough one within no time. Take some chapstick to help your dry lips. Beach camping can be a source of real fun. Experiencing it can leave some lifetime memories in your mind. That’ why we will say, whenever you get a chance, don’t miss any beach camping trip. However, it is also a fact that camping beside the water body is not that easy. You must be fully aware of all facts, tips, and tricks for beach camping. In this write-up, we have tried to give a detailed guideline on how to camp on the beach? Reading it completely can give a great idea to campers about beach camping gadgets and other related stuff. Don’t forget these points during your stay. Once you have adopted all safety measures, and beach camping tips properly, your trip is actually going to be superb.